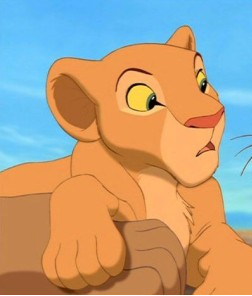 Nala is on of the character in the 1st, and 2nd movie of the lion king. She is a young beautiful lioness. She came from a normal pride of lions, and lioness. Her mother Sarafina (who is in the movie for a while). Her father Tai left Sarafina, and Nala. Nala was a new born baby cub when he dad left her. Soon after that Sarafina had an other baby cub, and his name was Mheetu. Simba, and Nala where best friends when they where young cubs. When Simba ran away from pride rock years past, and Scar took over pride rock. When that was happening, Scar wanted Nala to be his queen like he tried to do with her mother, but she turned him down. Then went of to go hunt. While she was hunting she found her best friend Simba who she thought died with his father. She told him what was happening at pride rock, and just caught each other in love, then Nala told Simba he has to come back, but he told her he cant, and she left off. She went back , and saw him there going to fight scar, and he won. He ask if she wanted to be the new queen, and she did. After she has a son named Kopa, and a daughter named Kaira. As a cub Nala is a bit sassy, spunky and just as curious, mischevious and ready to get in trouble as Simba is. She is firm about her ideas and beliefs, refusing to let Simba take credit for her idea to get rid of Zazu. This carries into her adulthood, where Nala has turned into a sharp-tongued, fierce, fearless, fiery adult lioness. She fights Simba into submission and isn't afraid to re-inforce to Simba that he is the rightful king no matter how he denies it or tell Scar that they (the lionesses) don't believe he's the rightful king despite being a lower rank at the time. She is not afraid to press Simba's buttons, blantantly and rather harshy replying "At least one of us does" to his "You're starting to sound like my father." Nala is a Slender lioness, with blue eyes, peach fur, light under fur. Nala is first seen as a cub, being bathed by her mother Sarafina. Simba, who has been tricked by Scar into visiting the Elephant Graveyard, asks her to accompany him to a great place. Initially, told the trip was to the watering hole, she is allowed to go on the condition that Zazu accompanies them, after which Simba reveals the true destination. As they travel, it's revealed by Zazu that Nala and Simba are not only best friends, but were betrothed at a young age by their parents. As a result they're expected to marry in the future, a revelation which scares both of them. 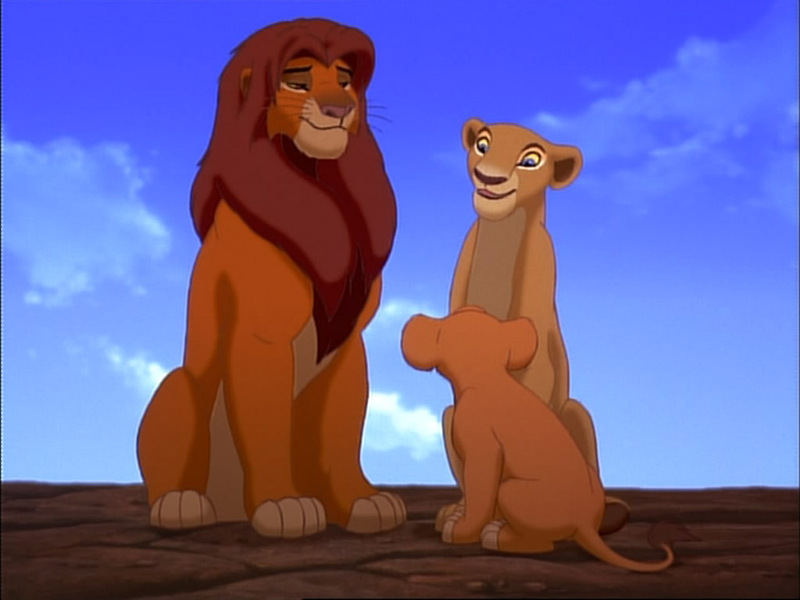 Simba and Nala come up with a plan to lose Zazu along the way by traveling through many different animal herds(the "I Just Can't Wait to Be King" sequence), which succeeds. Simba and Nala journey to the Elephant Graveyard where they encounter Scar's hyena minions Shenzi, Banzai and Ed. 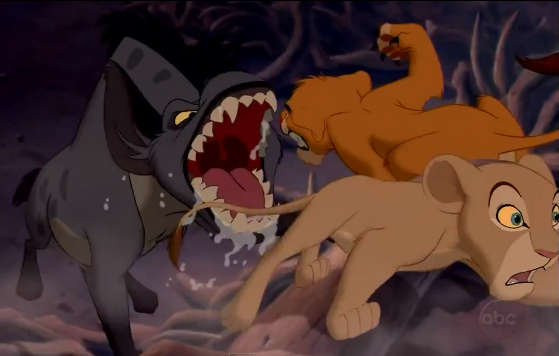 Nala attempts to escape alongside Simba, but the two are chased by the hyenas. After trapping the cubs, the three hyenas are attacked and scared off by Mufasa, who came to rescue the cubs. Afterwards, Zazu is tasked with taking Nala home, while Mufasa lectures Simba. Nala is being bathed by her mother, Sarafina. Simba greets her, whispering to her he just heard about a great place they could explore. Nala points out through clenched teeth that she's in the middle of a bath, accepting her mother's cleansing licks while Simba is abducted by Sarabi and given a bath of his own. Nala remarks, while her mother washes her lower back, that the place they're going to better not be dumb. Simba reassures her that it's really cool, but Sarabi gets suspicious. Nala dissproves of this "place" apparently being around the waterhole, asking what's so special about it. Simba whispers through his clenched teeth that "he'll show her when they get there", hinting they aren't really going to the waterhole. She realizes this immediately, asking her mother for permission to accompany Simba and then joining him in charming Sarabi into letting them go, and equally disapproves of Zazu keeping an eye on them. As they tread towards the water hole, Nala asks Simba in whisper their true destination to which Simba responds is the Elephant Graveyard. 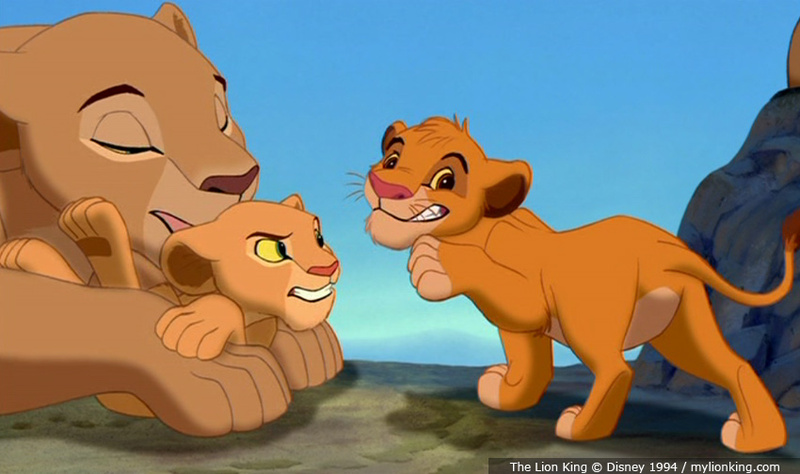 Nala responds with excitment, but Simba shushes her reminding her that Zazu is hovering just above them. Nala asks how they get rid of him, and the two cubs begin to whisper a plan to each other, something Zazu mistakes as them being romantic. The cubs glance at each other, shifting in confusion when Zazu mentions them being "betrothed" and similar terms they don't understand. Nala asks for clarification, and both cubs recoiling in disgust when they realize they are to be married one day. Nala comments them being married would be "weird", and points out since Simba is the future king, Zazu must do what he says when Simba states to do away with the betrothal. Zazu he doesn't, not yet anyway, telling Simba he's shaping up to be a pretty pathetic king. The two cubs proceed into "I Just Can't Wait to be King" in order to distract Zazu, trapping Zazu underneath the underside of a rhino and bounding away. Nala happily remarks how they lost Zazu, pointing out to Simba that the plan was her idea and pins him. When he decides to tackle her. He pushes her off, and he tackles her again only to be pinned again. A geyser interupts them both and the two realize they've arrived at and gawk at the Elephant Graveyard. Nala wanders into the hyena's home wondering if the elephant's brains are still inside, and Simba begins to trot forward to find out. Later on in the movie, Nala first appears as an adult relentlessly chasing Pumbaa through the jungle when he strays too far from Timon in pursuit of a beetle. She expertly keeps up with the warthog as he tries to throw her off by turning and twisting. Just as she lunges to kill him and Timon, Simba charges toward her, surprising her. The two fight, with Nala clawing at Simba's head, shoulders, face and mane until he tackles her and she uses her signature move, pinning him hard to the ground. When Simba says her name, she becomes surprised and gets off him up and inquires him about his identity. It only takes her a second to realize "Simba" was the name of the dead prince, and that this was the same lion. The two greet each other excitely, asking each other what they're doing here until Timon, confused as to why they are no longer fighting, breaks it up and demands to know what's going on. Simba introduces Nala to his two friends as his best friend. 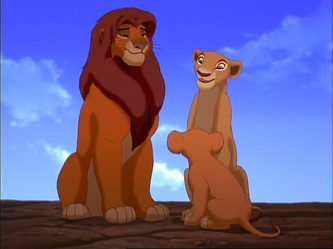 Nala is pleasured to meet them, but turns her attention back to Simba. She tells him excitedly about when everyone finds out here's been here all this time, unknowlingly reciting Scar's words exactly when he asks Simba was Sarabi would think of this. When Simba tells her no one has to know, she tells him everyone thinks he's dead especially after learning from Scar about the Stampede. Simba asks her for more, but the lioness insist it doesn't matter since he's alive and is the true king. Timon scoffs at this, telling Nala she has her "lions crossed". When Pumbaa begins worshiping Simba, the golden lion tells him to stop. Timon corrects Pumbaa; It's grovel not "gravel", laughingly saying that Simba isn't the king, but then curiously asking him if he is. Simba abruptly replies no, and Nala objects. He reinforces his argument, moving to walk off. Privately annoyed with Timon and Pumbaa's presence, Nala politely asks the two to excuse them for a few minutes. Once they are gone, Nala points out sadly to Simba how much his return would mean to everyone...and her. Simba reassures her it's okay and Nala nuzzles him, telling him she's really missed him. "Can You Feel the Love" The two nuzzle each other, they're affection leading into "Can You Feel The Love Tonight", where Simba and Nala unite emotionally as well as physically. Simba gives Nala a tour of the jungle, asking her if she thinks the jungle is a great place and Nala says it's beautiful, but begins to ask again why he didn't return home if he alive this whole time. She is unssatisfied with Simba's answer of wanting to "get out on his own" and "live his own life", seriously telling him they've really needed him at home. When he denies this, Nala again re-enforces he's the King and again Simba denies this, saying Scar is. Nala tells him about the choas that's been brewing in the Pridelands under Scar's rule, telling Simba if he doesn't return everyone will starve. Once more, Simba says he can't go back, moving to flee from Nala's questioning. Simba points out Nala left as well, but Nala counters, telling him she left to find help, that help being him and that he was their only hope. When again, Simba denies, Nala tells him he's not the Simba she remebers and that she's dissapointed in him. Simba again, moves to get away from her, grumbling at how her words reflected Mufasa's. Nala in turn grumbles as least one of them is willing to take up their responsibility and the have a very brief but heated conflict. Nala tries again, softly this time, to get Simba to tell her what he's been through, repsonding angrily when Simba refuses to tell her anything. After Simba returns, Nala is still in the jungle looking for him. She finds Timon and Pumbaa in hopes they know where Simba has gone off to. Rafiki tells them from atop a tree that "the king has returned." Upon hearing this, Nala is unable to believe that Simba has gone back, and after explaining the situation to Timon and Pumbaa, she runs off to to assist him. Just as Simba gets a eyeful of his home which has been utterly destroyed by Scar, Nala appears his side, Timon and Pumbaa in tow and the four head towards Pride Rock. They sneak past the hyenas, using Timon and Pumbaa to lure some of the others away, and Simba tells Nala goes to find Sarabi to rally the lioness while he looks for Scar. Sarabi is with Scar however, so she herself leads the lionesses to Pride rock just as Scar assaults Sarabi and Simba confronts Scar. 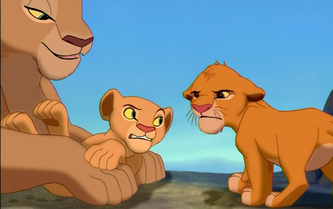 Scar brings up Mufasa's death with Simba, and confused, Nala asks what Scar is talking about. Upon hearing the "truth" the lionesses as shocked, Sarabi refuses to believe it. Nala shrieks in horror when Scar backs Simba over the edge of Pride Rock and is the first one to lunge forward when Scar admits that he, not Simba, was the one who killed Mufasa. After Simba emerges victoriously from his fight with Scar, he greets Sarabi and Nala before taking his rightful place as King. Then the lionesses watch with relief and joy as Simba ascends up Pride Rock and roars across his kingdom with the lionesses roaring back in reply. Sometime later, after the Pridelands are restored to its former glory, Nala stands alongside Simba, Timon, and Pumbaa as they proudly watch the assembly of the animals below Pride Rock. Then Rafiki presents their newborn cub to the animals of the Pridelands. Nala has a smaller role in the sequel to The Lion King. In Simba's Pride, she has visibly aged and her frame is heavier and larger. Her personality is different since becoming queen. Nala has become calm, mild-mannered, and motherly in the sequel. Simba and Nala now have a rebellious, adventurous daughter named Kiara. Nala's parenting approach contrasts with Simba's need to know that his daughter is safe. Soon after, Kiara has grown into a young adult. Nala talks to Kiara before her first hunt and nuzzles her after that. She next appears when Kiara is rescued by Kovu and reminds Simba that he owes Kovu 'Kiara's life' due to royal protocol. She is present that night when Simba has a nightmare about trying to rescue his father during the stampede. However, She is fast asleep and remains silent after the nightmare. 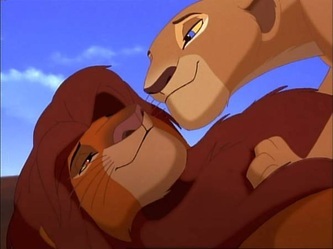 As Kiara and Kovu spend time together in the grasslands, that night, Nala finds Simba on a hill, desperately trying to seek advice from the great kings of the past. She consults him, seeing the good in Kovu that Simba can not see past due to Kovu's choosing to be Scar's heir. Nala is present in the final battle when she confronts Vitani. Vitani taunts her about Kiara Nala and her Pridelanders Prepare the battle disappearance, and the lionesses attack each other with Nala outmatching Vitani, though Vitani was younger and trained to kill. After Zira tackles Kiara and fall down the gorge, Nala gives directions to Simba as he leaps into the gorge to rescue Kiara, who is stranded above the swollen river. After Kiara is rescued and Simba reconciles with Kovu and the Outsiders, she journeys back to Pride Rock and stands atop the promontory with Simba, Kiara, and Kovu, roaring alongside them. Timon and Pumbaa, as they witness Simba and Nala falling in love Nala plays a minor role in The Lion King 1½. She is first seen when Simba reunites with her in the jungle, while Timon comments that Simba's love for her will tarnish their friendship with him. This leads to Timon and Pumbaa trying to ruin Simba and Nala's romantic evening in the "Can You Feel the Love Tonight" sequence. Nala is later seen walking up with Simba on a hill (to which they rolled down from) towards the end of the sequence. Also, Timon and Pumbaa see Simba leaving an argument he is having with Nala, and assure the romance the two lions had for each other is over. Finally, she is seen in an extension of the scene where she explains to Timon and Pumbaa about Simba's life. 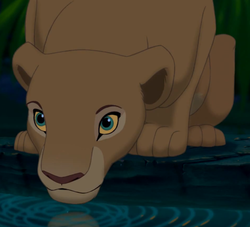 Although a minor role, Nala was still voiced by Moira Kelly in this film.